September 2, 2015 – The U.S. Navy’s fourth Mobile User Objective System (MUOS-4) satellite, built by Lockheed Martin, is talking from space to the satellite control team at the Naval Spacecraft Operations Control facility here after its Florida launch this morning. MUOS-4 will enable near-global coverage for a new secure military communications network offering enhanced capabilities for mobile forces. 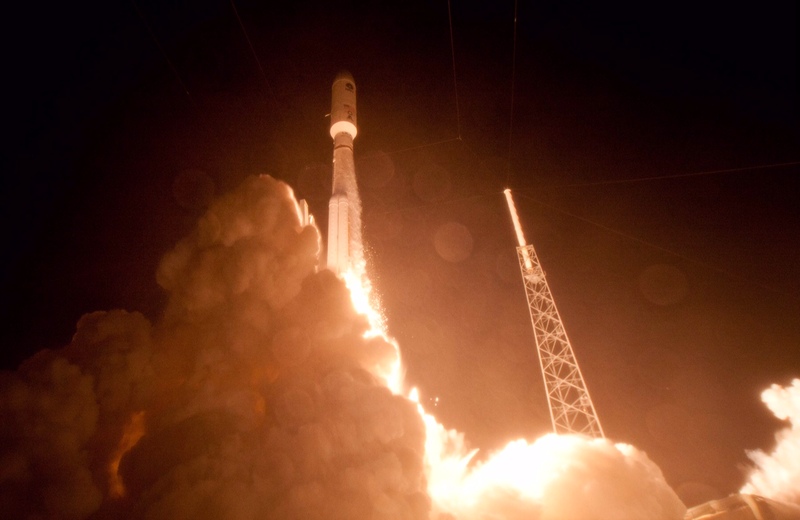 The MUOS-4 satellite launched at 6:18 a.m. EDT this morning aboard a United Launch Alliance Atlas V rocket from Cape Canaveral Air Force Station, Florida. A Lockheed Martin-led initialization team, stationed at Naval Base Ventura County, Point Mugu, California, is operating the satellite from its transfer orbit to its test slot. The Navy’s Program Executive Office for Space Systems and its Communications Satellite Program Office responsible for the MUOS program are based in San Diego. Lockheed Martin assembled and tested MUOS-4 at its Sunnyvale, California facility. MUOS-4 is the latest addition to a network of orbiting satellites and relay ground stations that is revolutionizing secure communications for mobile military forces. Users with operational MUOS terminals can seamlessly connect beyond line-of-sight around the globe and into the Global Information Grid. MUOS’ new smart phone-like capabilities include simultaneous, crystal-clear voice, video and mission data, over a high-speed Internet Protocol-based system. The addition of MUOS-4 completes the initial constellation and provides the MUOS network with near-global coverage, extending the reach of communications further toward the North and South poles than ever before. This morning, the MUOS-4 satellite separated from its Atlas V rocket approximately three hours after its successful launch. Over the next few days, MUOS-4 will transition to reach its geosynchronous orbit location approximately 22,000 miles (37,586 km) above the Earth. The satellite’s solar arrays and antennas will then be deployed, and on-orbit testing will start for subsequent turn-over to the Navy for test and commissioning to service. In June, Lockheed Martin completed and shipped the MUOS-4 satellite from California to the Cape. In August, technicians encapsulated the satellite in its protective launch fairing. The MUOS-4 satellite joins a network, which already includes MUOS-1, MUOS-2 and MUOS-3, launched respectively in 2012, 2013 and January 2015, and four required MUOS ground stations already completed. Once fully operational, the MUOS network will provide comparatively 16 times the capacity of the legacy ultra high frequency communications satellite system, which it will continue to support, and eventually replace. As part of Lockheed Martin’s “Launch and Learn” program, company volunteers visited nearby Ronald McNair Magnet Middle School, in Rockledge, Florida, to tie the MUOS launch into science, technology, engineering and math (STEM) education. Employees led a hands-on Engineering Design Challenge for nearly 500 McNair middle school students to demonstrate the important principles of space engineering.